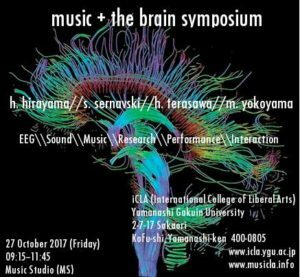 This presentation proposes a method to interpret the data of human brainwaves (EEG) into images and musical notes in order to represent mental states by multimedia performance. This presentation also describes an example of theatrical output that explores relations between some elements that are expected to influence the levels of stress, concentration, or relaxed feelings and actual performer’s brainwaves reactions-the arousal levels of brain—proposing an example of bio-art performance. During the performance, the data of brainwaves is translated into eight types of images according to frequency ranges, as well as musical notes, and the strongest signal every 0.5 seconds is defined as the primary image and as a note for an instrument, using Processing and the Bach library for Max/MSP. In the piece, two actor(s)/actress(es), one of whom wears a brain sensing headband, play out scenarios in an extemporised way. This work has been performed repeatedly, but the latest performance at the 2017 International Computer Music Conference (ICMC) in Shanghai resulted in the discovery of very interesting phenomena, involving real-time feedback from the audience. Although the technology utilised in this work may have been primitive, the outcomes of this performance could suggest the possibility of a new type of multimedia bio-art theatre piece.